It's been a whole week since my last blog post but I've been so busy I haven't had a chance to! This week I attended the Go Glam Gala and I've been helping out my mum as much as possible since my poor little sister had an op on her ankle too. On top of that my aunt is over from France this weekend too to help us out since my dad and brother are living it up in Vegas! Lucky buggers. 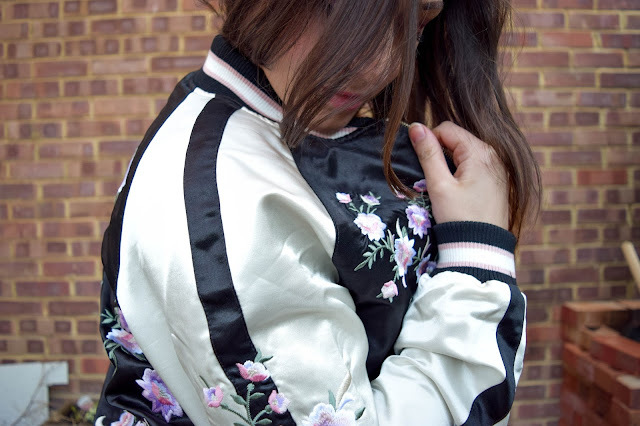 Anyway, today I'm sharing with you my gorgeous bargain of a bomber jacket I bought in the Boxing Day sales. It's one of my favourite things in my wardrobe right now and I've just got to tell you about it. I always forget how nice the clothes are in supermarket clothing brands. 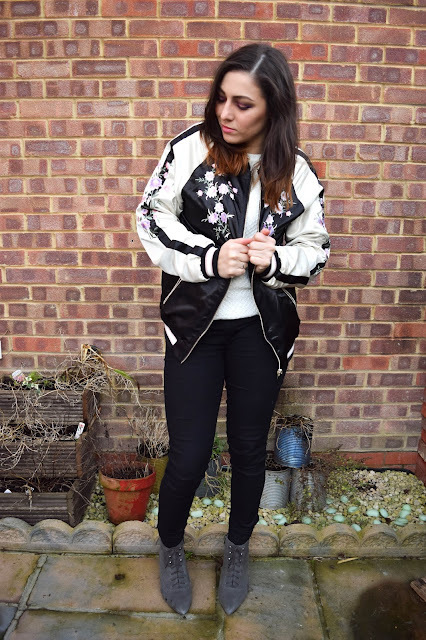 I've always loved F&F in Tesco and I've got some of my favourite pieces from there including this bomber jacket. I bought this in the boxing day sale back in December and for a steal at just £9! YEAH. £9!!! I couldn't find it in a size 10 so I picked it up in a 12 but I kind of like that it's a little bit oversized for me. It's comfortable, warm and the design is just gorgeous. I hadn't added any embroidery into my wardrobe yet and I really wanted a bomber jacket too so when I saw this it was like a two in one deal. 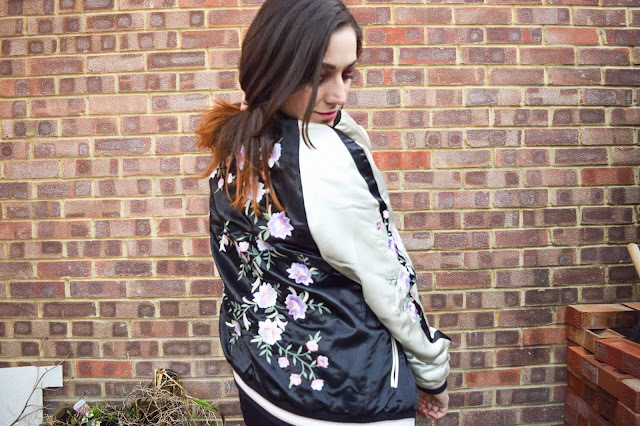 I've got myself the bomber I'd been admiring on others with an infusion of embroidery into my wardrobe that I'd been wishlisting. 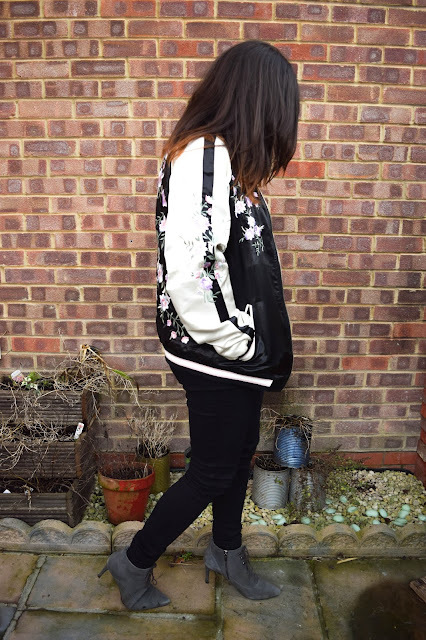 It's a very new style for me having never owned a bomber or embroidered pieces before but I love it and I think it works well in my wardrobe already. It's not exactly the most versatile piece, but more of a statement. With jeans and a simple tee or a jumper, it looks good! I can't wait to get some good use from it this spring. I think I'll get more use from it in the spring when it starts warming up. I don't think it'll keep me warm in the -3 degree weather we're having right now. I'm trying something new here on my blog today, with a new year I'm going to try and lay out my outfit posts a little differently. I hope you like it, because I'm not 100% sure myself. But I'd be happy to hear your thoughts on both the outfit and the new post layout!